Collections that are of interest to the International Institution for the History of Surveying & Measurement include instruments, books and documents. There are numerous collections of old surveying instruments around the world, many of which are not catalogued or listed in any form. For Europe there is a listing of collections in Historische Vermessungsinstrumente (Historical Surveying Instruments) by Helmut Minow. 2nd edition. 1990. Verlag Chmielorz GmbH, Wiesbaden. ISBN 3-87124-064-8. The listing does not include private collections. Many museums and similar establishments have small collections but from this reference it will be obvious where the main collections are housed. Epact is an electronic catalogue of medieval and renaissance scientific instruments from four European museums: the Museum of the History of Science, Oxford, the Istituto e Museo di Storia della Scienza, Florence , the British Museum, London, and the Museum Boerhaave, Leiden. This virtual museum provides photographs and short descriptions and particulars of the (presently) 100 instruments held by the closed access UNSW Surveying Instrument Collection. The collection contains 'scientific and mathematical instruments', 'theodolites', 'levels' and 'EDM instruments' that were donated by government departments, companies and individual surveyors or were kept from inhouse stock on reaching obsolescence. For example the collection includes a 1959 Geodimeter NASM-2A electronic distance meter and the Watts & Sons theodolite used for the setting out of the Sydney Harbour Bridge (1925-1931). The International Institution for the History of Surveying & Measurement mounted a very successful exhibition on The Art and History of Surveying & Measurement in parallel with the FIG Congress in Brighton, UK in 1998. That exhibition consisted of 43 panels each containing a total of around 150 images depicting events in the history of surveying. It was accompanied by a descriptive booklet listing the numerous international sources from which the illustrations were obtained. Since its launch it has been shown in Switzerland, S Africa and at other venues in the UK. It is available for purchase on CD ROM for anyone to exhibit. Further details from David A Wallis. 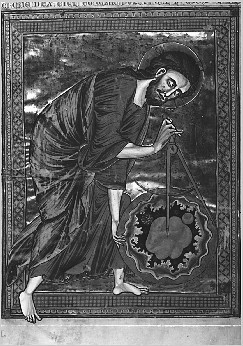 God the Geometer. 13th Century Manuscript. The Austrian National Library, Vienna. Courtesy of Ernst Höflinger. What is Surveying & Measurements?